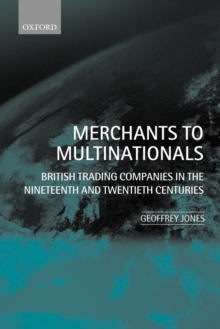 Merchants to Multinationals examines the evolution of multinational trading companies from the eighteenth century to the present day. During the Industrial Revolution, British merchants established overseas branches which became major trade intermediaries and subsequently engaged in foreign direct investment. Complex multinational business groups emerged controlling large investments in natural resources, processing, and services in Asia, Latin America, andAfrica. While theories of the firm predict the demise over time of merchant firms, this book identifies the continued resilience of British trading companies despite the changing political and business environments of the twentieth century. Like Japanese trading companies, they 're-invented' themselves in successive generations. The competences of the trading companies resided in their information-gathering, relationship-building, human resource, and corporate governance systems. This book provides anew dimension to the literature on international business through the focus on multinational service firms and its evolutionary approach based on confidential business records.